Please note: We reserve the right to remove any unlawful, defamatory, or obscene activity or posting on this page without notice. The University has installed a new parking guidance system in the garages that will direct parkers to open spaces using red and green lights, as well as illuminated signs detailing how many spaces are available. The campus Cougar Line shuttles have been replaced with new and improved buses for all of the Cougar Line routes. Riders will now enjoy free Wi-Fi, audible shuttle stop announcements and more! The 2018 football home game schedule was released and in addition to the Saturday games, there are two Thursday games slotted for the UH campus. The fall semester is about to start and we wanted to share a quick guide to help make sure you are prepared for your campus commute. UH Parking and Transportation is transitioning to License Plate Enforcement to better ensure space availability for permit holders. As we wrap up the spring semester and many Coogs leave campus for the summer, we would like to leave you all with some helpful information for the upcoming months. With permit registration open for 2 weeks now, we wanted to take you behind the scenes of our registration process. We understand there are some questions and concerns regarding Zone Parking that have come up the past few days and we wanted to make sure these are addressed directly. Student permit registration launched this week, so we wanted to provide updates and answer some common questions we received. The current theme surrounding UH Parking and Transportation is change and progress. Part four of the Parking Preview for 2018-2019 series highlights the upcoming Outreach Events where PTS will be available to answer questions and provide information about transportation options for next year. Part three of the Parking Preview for 2018-2019 series covers the new Zone Parking Program and the new permit registration process for students. Part two of the Parking Preview for 2018-2019 series delves into the details of the new rates, including how rates are determined, where the money goes and some solutions for faculty, staff and students who want to save money. In part one of the Parking Preview for 2018-2019 series, we take an early look at several of the main changes that will be happening next academic year. This month we’re kicking off one of our parking improvement projects with the installation of a Parking Guidance System in the parking garages. Before we pause this blog for the winter to start preparing for the spring semester, I want to leave you with some helpful information. The Transportation and Parking Advisory Committee is a group of faculty, staff and student representatives that meet monthly with Parking and Transportation leadership to discuss and make recommendations on important transportation issues affecting campus. This post covers all things related to permit oversell from what it is, why PTS uses it, what UH oversell rates are and more. On Thursday, Oct. 19, people will be flooding the UH campus to watch the Cougars take on Memphis in TDECU Stadium. Campus roads, parking lots and garages will be affected, so everyone will need a plan for getting to campus that day. There are some questions PTS sees repeatedly online about parking on campus, especially regarding prices. Read the answers to those questions in this week's post. After Harvey shook up the start of the semester for everyone, I wanted to pause and give credit to my team for the work they did while we navigated the campus needs during and after the storm. To start off the 2017-2018 academic year on the right foot, we want to make sure the rules and the perks of each permit type are clear. That's why we have created a complete list of all Faculty, Staff and Student permit options with details about what each permit type can do. This post is dedicated to remembering our good friend and coworker, Leighanne Dean. You may not know her by name, but she was the marketing queen responsible for the infographics and banners you saw and loved. Parking is still enforced as usual during all summer sessions, so if you don't have a permit already, be sure to purchase one through AccessUH. New permit rates and types, changing lot allocations and additional shuttle stops are just some of the things we're working to implement at the start of the fall semester. Learn about all of that and more in this week's post. Jenna Done, a senior pursuing a bachelor's degree in human resource development, commutes more then 40 miles one way to get to the University of Houston. Read about her take on public transportation and more in our latest commuter spotlight. Industry trends and studies are forecasting some pretty interesting things regarding the future of parking not just here, but across the world. It will be interesting to see what this means for the future of our operations down the line. Coogs, the big game is less than two weeks away. The days leading up to the matchup between the Patriots and the Falcons are filled with a number of events, including some on our campus, so familiarize yourself with what's going on and be prepared to welcome thousands of visitors to our great city! Classes may have been out of session, but we didn't stop working. Familiarize yourself some of the upgrades and changes we made to our services and parking lots over the winter break by reading the latest edition of Word on the Street. Through press releases, social media posts, videos and more, we're constantly promoting and sharing information about the various services and programs offered through our department, yet we rarely, if EVER, take a step back and share the stories and feedback we hear from the individuals actually USING these services. Our new Commuter Spotlight series is working to change that as we begin to periodically highlight the various ways people can and are taking advantage of all Parking and Transportation Services has to offer them. From how to return a parking permit you won't need in the spring semester to how graduation may impact parking and transportation on campus, this week's blog posts covers some important items to keep in mind as the fall 2016 semester comes to a close. 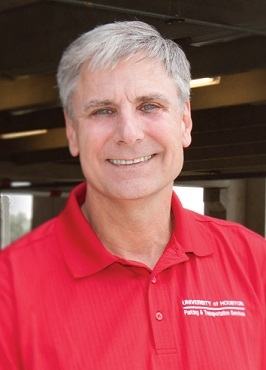 Since 1997, Bob Browand has put his over 30 years of parking industry experience and know-how to work as the leader of UH's Parking and Transportation Services department.